Design thinking is a prototype driven, iterative method of creative resolution of problems characterized by human-centered approach. The nature of the design thinking process is collaborative and playful. Let's take a look at some tools which help to merge design thinking with Instructional Design. The collaborative and playful nature of the design thinking process is probably one of the reasons why design thinking is winning hearts of people in many industries. Could this approach be used also in Learning and Development industry? Definitely yes! Let's delve into this topic. Learning Battle Cards is a deck of 108 cards used as a reminder of learning approaches and tools. It could be used as an inspiration which supports discovery and exploration of Instructional Design methods. As a kinesthetic tool it brings a lot of fun and engagement into brainstorming and ideation which is one of the key elements of the design thinking process. Every card from the deck brings additional information about learning approach which let to use them in a deliberate way. You can find more information about LBC here. "7 Windows of Instructional Design" is a framework of thinking about the learning process. It consists of 7 spaces ("windows") which should be taken into consideration while working on instruction. From one perspective it curbs the creativity of the Instructional Designer, from the other, however, it brings structured, end-to-end way of thinking about changing behaviors of trainees (which is the ultimate goal of every single learning intervention). "7 Windows" creates the backbone for the whole family of LBC tools. If you take a look at the picture above you will find text representation of them in the top-right corner of the back of the card. 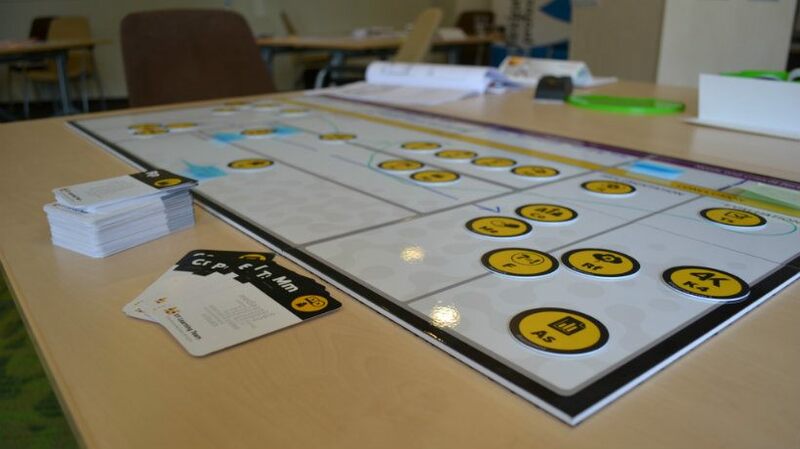 This way of thinking about the learning and development process was also visualized in the Learning Battle Cards Development Kit and the Learning Battle Cards Canvas (see visuals below). More information about "7 Windows" could be found here. The Learning Battle Cards Maps are big discovery maps which let Instructional Designers explore the space of learning tools and approaches related with a specific learning idea (which is usually the focal point of the map). 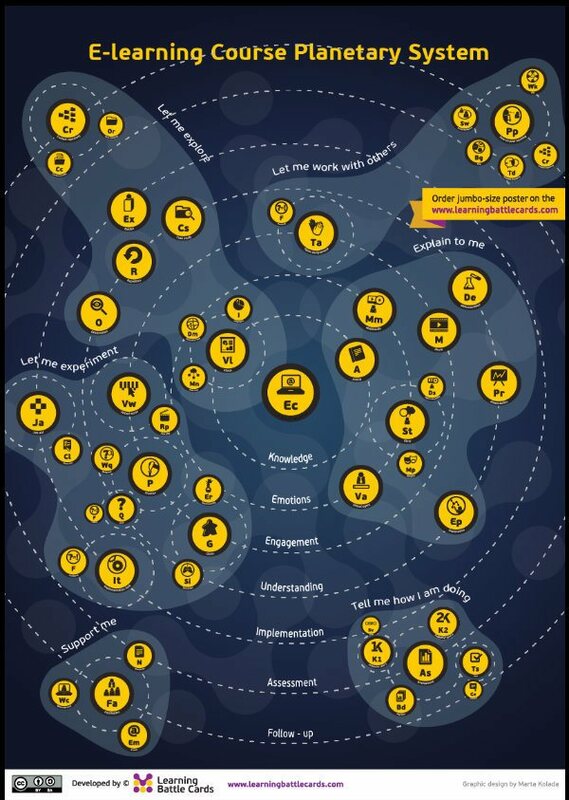 The LBC Map uses a metaphor of the solar system showing on various orbits areas which should be taken into consideration while designing the learning intervention placed in the middle of the map. Wandering through the LBC Map, the Instructional Designer is also inspired by various angles of thinking which help him/her build an efficient learning intervention. The LBC Map was described here and here. The LBC Development Kit is a full-scale Instructional Design "game". It consists of a big magnetic board with the "7 Windows" Instructional Design framework. 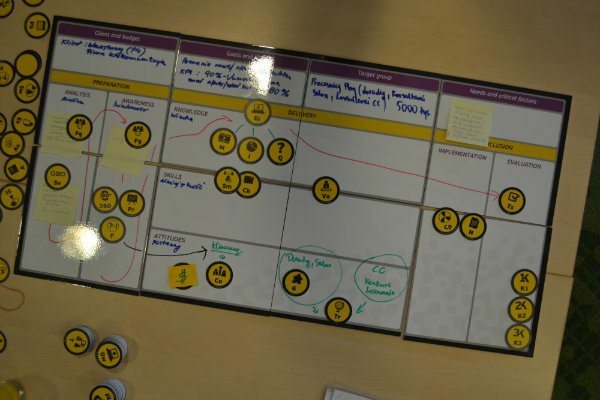 As an Instructional Designer you play on this board with 200 magnetic tokens representing various learning tools and approaches which could be taken into consideration in you learning and development challenge. The board is covered by a whiteboard surface which lets you draw, mark, and add additional comments on post-its to the instructional idea. The Instructional Design framework with the set of tokens and deck of cards build the complex Instructional Design environment which helps focus both on the method and the available learning solutions which could be used. Work with the LBC Development Kit is extremely engaging and fun - especially when you invite to this activity a team of 3-4 people. More information about the LBC Development Kit could be found here. The LBC Development Kit is a complex, big, heavy-loaded, and expensive solution. 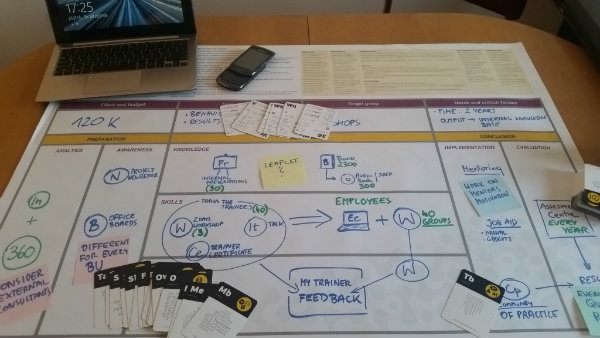 To meet the requirements of less demanding Instructional Designers, we created the Learning Battle Cards Canvas. The Learning Battle Cards Canvas is flipchart-sized sheets of paper with "7 Windows" and an additional guide how to use it. It is a disposable paper-based tool which could be used just with a marker and a bunch of post-its in hand. 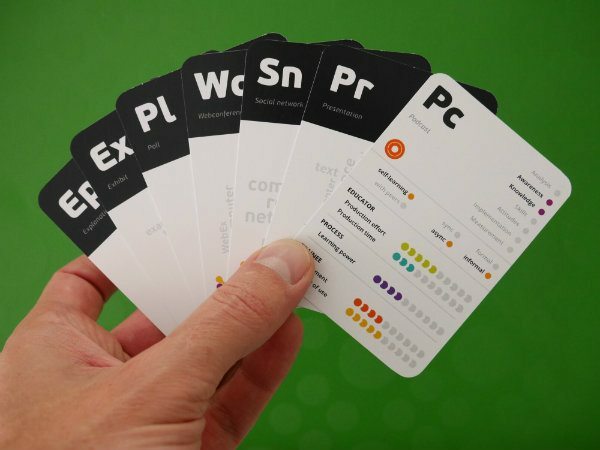 The LBC Canvas is a much lighter version of the LBC Development Kit without many features (like magnetic tokens, whiteboard surface, ability to erase/alter instructional idea), but for many purposes (e.g. 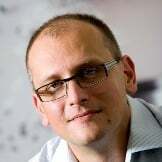 Instructional Design workshops, Instructional Design sessions during conferences, or just one-time Instructional Design activities which do not require the LBC Development Kit) it works great. All of these tools have been created, tried, tested and re-created many times in an iterative design thinking process during last 5 years. We are very proud of them and we are very positive in terms of value which they bring to the Instructional Design process. Some of them are free (e.g. an idea of "7 Windows" described in the eBook available on our website, or small versions of LBC Maps available on a Creative Commons licence). The others you can buy in our store. You will find it on our website.